ST. GEORGE — For Taylor Doose, growing up in Salt Lake City as an only child in a family who were not members of The Church of Jesus Christ of Latter-day Saints meant constantly questioning where he fit in. Without the built-in belonging that comes from having siblings and not having the ties that come from membership in the dominant religious group, Doose found himself growing up without a tribe. Now Doose is telling his story through his documentary film, “Finding My Tribe,” which will screen Wednesday and Friday at the Electric Theater as part of the Docutah International Documentary Film Festival. There will also be a living art tattoo reception held Tuesday at the Roene B. DiFiore Center for the Arts. Doose’s story is personal. Yet it is familiar at the same time to many who have felt they don’t fit in, especially in Utah. It is a story about finding both belonging and individuality, all told through the subculture of tattoos and the people who get them. Salt Lake City is a beautiful, clean, friendly place to grow up and raise a family, unless you happen to be different in any way. … In ‘Finding My Tribe’ the filmmakers take a microscope to society’s views and how they have evolved with the growing acceptance of tattoo culture and the people that wear them. The synopsis goes on further to question whether tattoos make one part of a group or more of an individual. Though Doose struggled to know where he fit in growing up, he was always certain of what he wanted to be, he said. At the age of 16, Doose had the opportunity to work on a film set. He described himself as the annoying kid who wouldn’t stop asking people questions about filmmaking. When he was 18, Doose said, he came to Southern Utah to attend Dixie State University’s film program. “At the time it was the best film program in the state,” Doose said. But shortly after entering school, the film program dissolved, Doose said, so he returned to Salt Lake City to find work. Doose said his heart always knew he wanted to make movies, so after working for many years, he decided to return to school. “Something inside of me said, ‘You are never going to be happy unless you are making films, so maybe you should go back to school and pursue your dream,'” Doose said. Doose’s father, the executive director of the Roene B. DiFiore Center for the Arts, described his son as a large man with no available space left on his body for another tattoo. But it wasn’t always that way for Doose, who said he used to hate tattoos. Then tragedy struck. Doose was in a horrific accident. Among other things, he had ruptured his spleen, he said, and was only an hour from bleeding to death. Doose said it was a life-defining moment for him, one that he didn’t ever want to lose its power. So he marked his experience and his new outlook on life with two tattoos: a red star on his right calf and a blue star on his left calf; one for the person he was before the accident and one for everything that would come after. And like a butterfly’s colorful wings, Doose continued to color his body canvas with the art and stories of life. 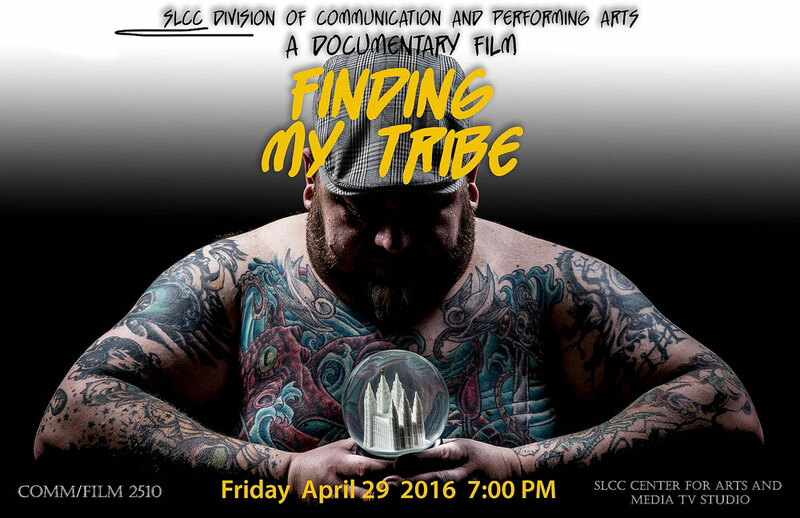 “Finding My Tribe” will screen at the Docutah International Documentary Film Festival Wednesday at 8 p.m. and Friday at noon in the Electric Theater, 68 E. Tabernacle in St. George. A special living art tattoo reception will be held Tuesday at the Roene B. DiFiore Center for the Arts, 307 N. Main St. in St. George from 6:30-8:30 p.m. The reception will feature tattoo artists from several area tattoo studios showcasing their work and talking about their art. The reception is free to attend. Additional information: All-event passes, all-day passes and single movie tickets to Docutah are available online or at the Cox Auditorium Box Office located on the Dixie State University campus at 375 S. 700 East, St. George. Single movie tickets will also be available during the festival at the Eccles Box Office, 225 S. 700 East, St. George. All-event passes are advance purchase and will only be available until Tuesday. Did you get that tramp stamp removed? Hahahaha JK Bob. ? You’re going to miss out on a lot of wonderful people in this life with that attitude. And honestly, it sounds like you deserve it. I’m speaking from personal experience. I’ve known and worked with many many folks with tatts. There’s those who got tatts in there teens or 20s, those who might have got military tatts. Most of them seem to grow out of this “tattoos are cool” mentality at some point in their 20s. The locations and size of the tatts tell me a lot about their decision making skills in life–those with neck or facial tatts almost always, from what i’ve seen, have a history of poor decision making. There are also certain personality types–many tattoo fanatics i’ve known are instant gratification types that don’t plan much into their future. Not very intelligent, huh? Then explain how I managed to get a Master’s Degree in addition to the other four college degrees I have? Explain how professionals like lawyers and doctors with tattoos are also idiots or degenerates. I guess it takes one to know one. If your a person with a tattoo don’t mind Bob. he has a problem with the whole world and everything in it !